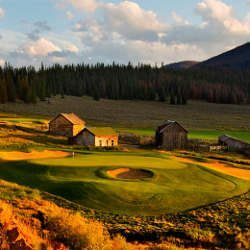 Long a favorite area for Texas skiers, Summit County in Colorado is also a perfect summer-time destination for golfers looking for great courses in picturesque settings. 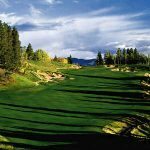 One of the top courses in the state, the Ranch Course at Keystone offers a Scottish “links” layout through a scenic mountain valley surrounded by awe-inspiring peaks. 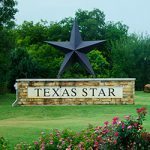 In addition, Keystone provides plenty of summertime family activities, excellent dining and cool weather. The 7,090 yard course, designed by Robert Trent Jones, Jr. (1980), is built on a site where Ute and Arapaho Indians once hunted buffalo. The sixty-year-old Ranch House now serves as the golf shop, clubhouse and hosts an outstanding gourmet restaurant. 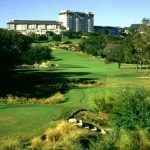 Golfers will enjoy the excitement of launching “Tigeresque” drives through this alluring setting. Well-struck shots in this high-altitude setting (9300 feet) may fly extra distances, up to a two-clubs difference depending upon conditions. The adventure begins with scenic drive down a tree-lined par-five that is reachable with an accurately placed shot. This is the best eagle opportunity of the day. Water comes into play on the par-five sixth hole, with a lake left of the fairway and a stream crossing the fairway to the left of the green. The landing area to the right side of this # 1 handicap hole short of the green is safer than it may appear. The par-five thirteenth hole requires an accurate long tee shot to set up any chance of birdie. Any errant drives landing into the marsh should usually be played back into safety to avoid a big number. Jones provides a great finishing hole. The 589 yard par-five is along the right side of a nine-acre lake. Tee shots are launched over a marsh and the lake to the fairway between two bunkers. Players attempting to get home in two must again negotiate the lake left and the bunkers in front of, and to the right of the green. Of the par-three holes, the fifth is the most memorable. Playing 190 yards from the back tees, the large green is guarded by three bunkers, with old ranch buildings providing a rustic setting. A left pin position on the par-three seventh hole may entice golfers into a watery grave. Picking the right club is the key to two short downhill holes (12 & 14) on the back nine. There is a good mix of par-fours at Keystone which reward good shotmaking while presenting obstacles to those that stray too far from the fairways. 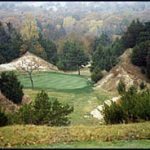 The second is a challenging hole of 433 yards through the pines. It is followed by a dogleg-right that provides a good opportunity for a birdie, especially for drives that carry the right bunker. The first “links” hole is the fourth hole. From a highly elevated tee, golfers must avoid the stream down the right side which may be reachable by long knockers when it crosses in front of the green. The challenging dogleg left, 422 yard eighth hole plays uphill to a green protected in front by bunkers. The short ninth hole is just pure fun. 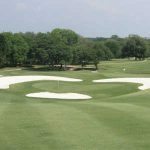 While conservative players can land mid-iron shots safely in the fairway left of the water, bolder players will attempt to reach the green, launching their tee shots over a lake to a two-tiered green also protected by two bunkers. The back nine begins with what may be the most difficult hole on the course, a 463 yard par-four. The second shot is played sidehill slope to a small green. This challenge is followed up by shorter hole of 351 yards which is played into an elevated green. Those with a long draw in their arsenal may fire away at the pin. Turning back home, the seventeenth hole offers a picturesque view of the valley. Tee shots must carry over one marsh area while staying short of the second marsh area on this 414 yard hole. The Ranch Golf Course at Keystone provides a good test of strategic shot-making through natural scenery. 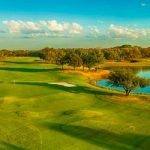 With another 18 holes under development, Keystone is sure to remain a popular attraction for summer tourists and conventions, as well as Texans looking to escape the summer heat.